Spinach salad–fast, healthy and tasty! Just put out a bed of spinach on a plate. 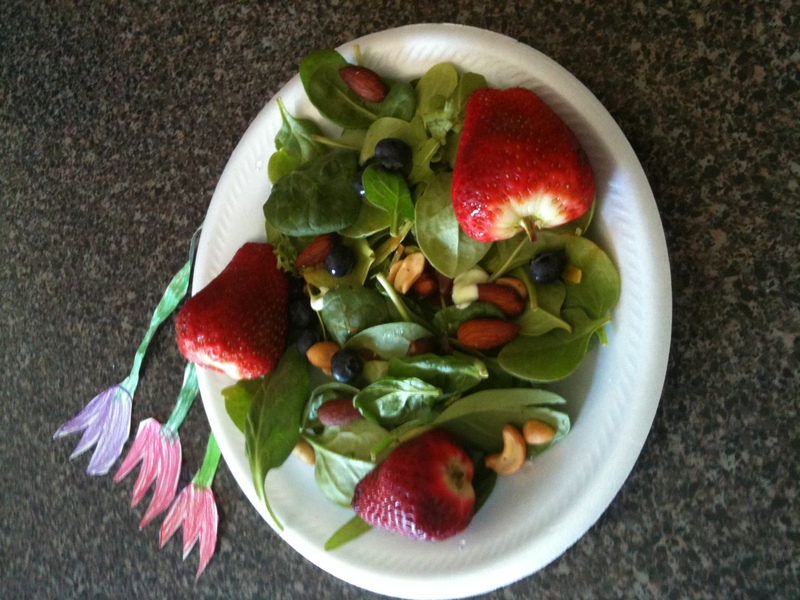 Add strawberries, nuts, blueberries and optional dressings. You can also substitute with your choice of berries and (fat free) dressing. Spinach is alkaline in nature and hence it is great for you if you are on a higher protein diet. 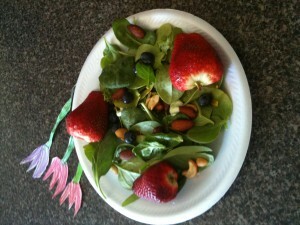 This salad is great as a lunch “first step” . Eat your grilled chicken or fish after this, and you have eaten a healthy, nutritionally balanced and filling lunch under 400 calories! Looks good! I have yet to try making a green smoihtoe myself. You’re definitely inspiring me though!As far as veggies, my kids like salads and many kinds of raw veggies, especially if there’s ranch dressing involved. The best way to get them to eat them is to offer them when they are hungry in the afternoon or right before dinner. In fact, I sometimes put some veggies on their plate before the main dish is ready, when I’m finishing setting the table. They think it’s a treat when I let them eat early.We’re also avid avocado eaters (the kids more so).